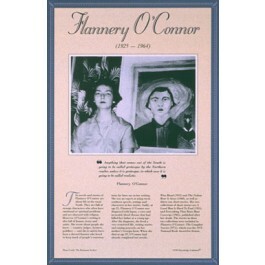 This unique educational poster of writer Flannery O'Connor features a striking photo of her, as well as a quote from the author, and concise biographical text summarizing her life and career. 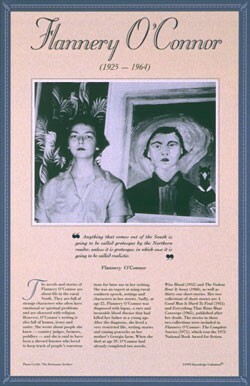 The novels and stories of Flannery O'Connor are about life in the rural South, and are filled with strange characters. Sadly, she was diagnosed with lupus at age 25 and died at age 39. But in her short life, she completed two novels, and 31 short stories. Eight years after her death, a book of her complete short stories won the 1972 National Book Award for fiction. This poster is a great way to introduce students to this interesting and important American writer.